StopTech recognizes that great brakes need to look as good as they perform. Performance wheels and tires are best complemented with StopTech SportStop Cross-Drilled rotors. 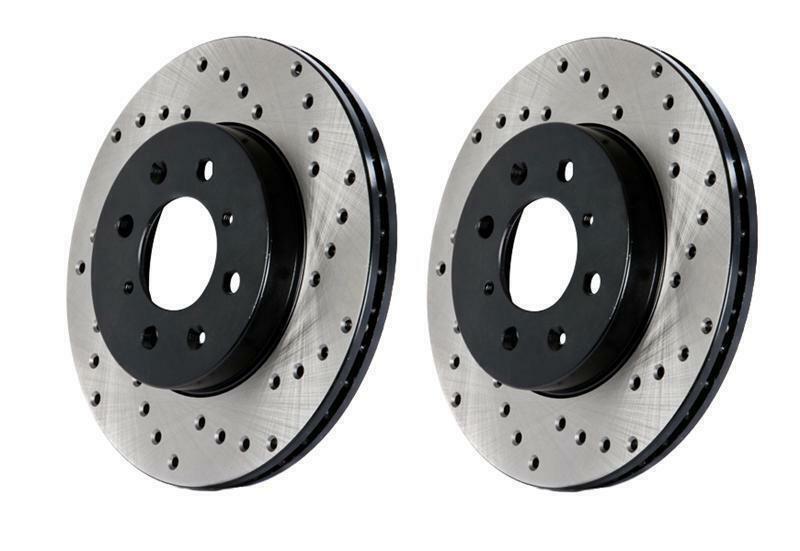 SportStop Drilled brake rotors prevent glazing of the pads, add bite and improve wet and dry braking performance. Every SportStop Drilled brake rotor is produced from a high quality Centric Parts blank casting and finished in a durable e-coating for corrosion resistance. SportStop Drilled rotors look great behind custom wheels, improve the initial bite of the brake pads, and help wipe away the debris that forms between the pad and the disc. A set of SportStop cross-drilled rear replacement rotors is a great way to match the aesthetics of a StopTech Big Brake Kit with the cross-drilled rotor option. Every SportStop rotor is finished with black e-coating on both sides of the hat, inside the the cooling vanes, and on the outside edge. E-coating is a superior electro-statically applied finish designed to withstand 400 hours of salt water exposure without rusting. This is especially important on both mounting faces of the hat where it touches the hub flange and back face of the wheel. Any accumulation of rust in these area can lead to installed lateral run out issues. Power Alloy metallurgy is exclusive feature of SportStop rotors. In specific vehicle applications, StopTech works with foundry partners to increase the molybdenum or carbon content of the castings, and to carefully control the cooling rate during production to reach targets for hardness and tensile strength. Nearly all SportStop cross-drilled rotors have unique drilled hole patterns for the left and right sides of the vehicle. For these directional patterns, straight vane or pillar vane rotors are used to ensure that a drilled hole never touches a cooling vane.